Fortress Of Freedom Board :: View topic - Canadian Tamils Urge Action On U.N. Panel Report! Canadian Tamils Urge Action On U.N. Panel Report! 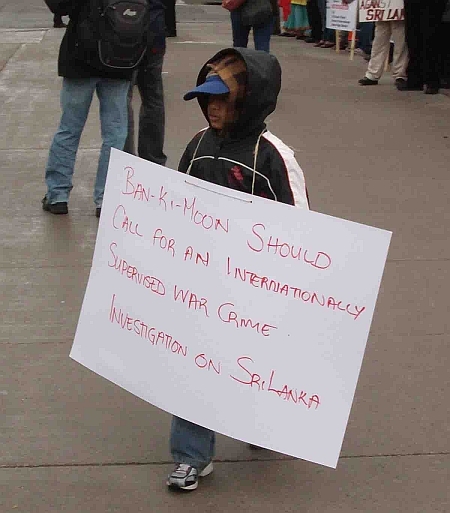 Posted: Fri May 06, 2011 9:38 pm Post subject: Canadian Tamils Urge Action On U.N. Panel Report! The lineup of protestors on University Avenue! 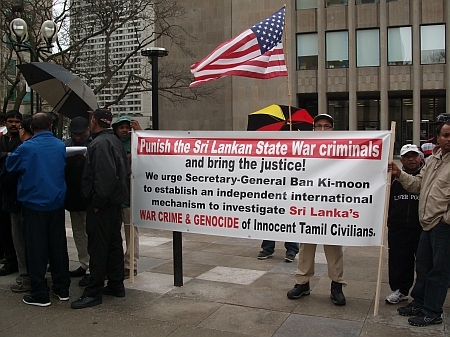 Toronto, Canada/May 6, 2011: Tamils gathered at the U.S. Consulate here in Toronto to support a United Nations panel's call for a probe into alleged war crimes that were committed at the end of Sri Lanka's conflict with the Tamil Tigers two years ago. That U.N. panel report stated that tens of thousands of civilians were killed in the conflict due to shelling of so called no-fire zones by the government (like hospitals and such operated by the Red Cross and the U.N.). 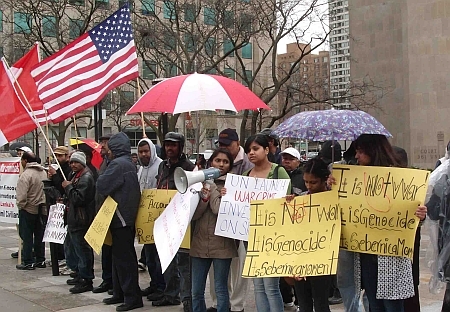 The demonstration of about two hundred Canadian Tamils was to garner support for the United States and other powers to act on the panel's conclusions. Banner urging the United Nations to act now! The protest was one of the smallest of the Tamil protests from the ending of the conflict. The gathering lined the east side of University Avenue at the U.S. Consulate. The group had the usual banners and many Canadian and American flags flew at the protest. The main group with a blowhorn! The group lined themselves up into two columns along the road displaying placards and chanting slogans which included thanks to "Cannel 4" (Omini News) for reporting on the event. OMNI News at the protest! A light rain persisted during the afternoon and usually that type of weather would cut short most protests but these people stayed their ground and kept up the chants and presentation of their placards and banners. Entire families including grandparents came to the event. There were some professionally printed banners but most of the placards were of the home made variety indicating a more grassroots response. 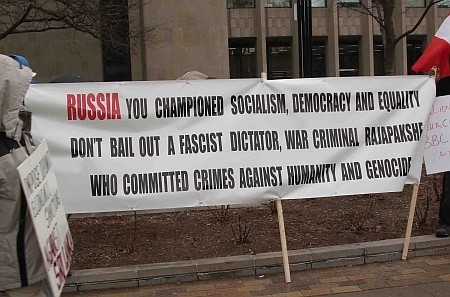 Criticism of Russia with regard to the conflict. One interesting note is that this protest, unlike the larger protests at the end the conflict, did not close down University Avenue. The closure of streets like University Avenue and the Gardner Expressway made the protests citywide news during the final days of the conflict. This one did not block the roads but received far less notice by the media. Looking back at this series of protests the question I pondered was whether the blocking of streets was justified. Streets are closed for many "good" reasons: construction, parades, emergency vehicles, street festivals and bicycle rides such as the yearly "Becel Ride For Heart" on the city's freeways. Does "freedom of expression" achieve the same merit as the reasons above? While this by no meas a decision one way or the other, it is just offered as food for thought.